FIRST: Please note: The internet opportunities on this Camino are very infrequent so far, so no, I have not died, but though I’m writing on my Word docs, loading pics onto iPhoto, etc., I am unable to post frequently thus far, as I did two years ago on the Camino Frances. I just began this post and had several paragraphs written, and everything disappeared. I’m sure it was operator error, but after a very hard day of walking (though easier for the most part than the past two days.) I decided I just want to go to bed, give my feet a rest, my back and neck, my arms, my entire body, which feel as though they have all been beaten with rocks and brilliant sun, two days of 95+ temperatures, accompanied by as many as 500 steps in the first couple of hours each day. Yes, 500. Oh, and today, a thunderstorm in the midst of walking for four hours on huge stones and dirt, making the road to Yankee Boy Basin look (and feel) as though it is flat pavement. So I promise I will catch up with myself, and will make notes before I go to sleep. But here are two photos from the first couple of days. More later this week . . . thanks for following. My first meal . . . Irun, Spain. 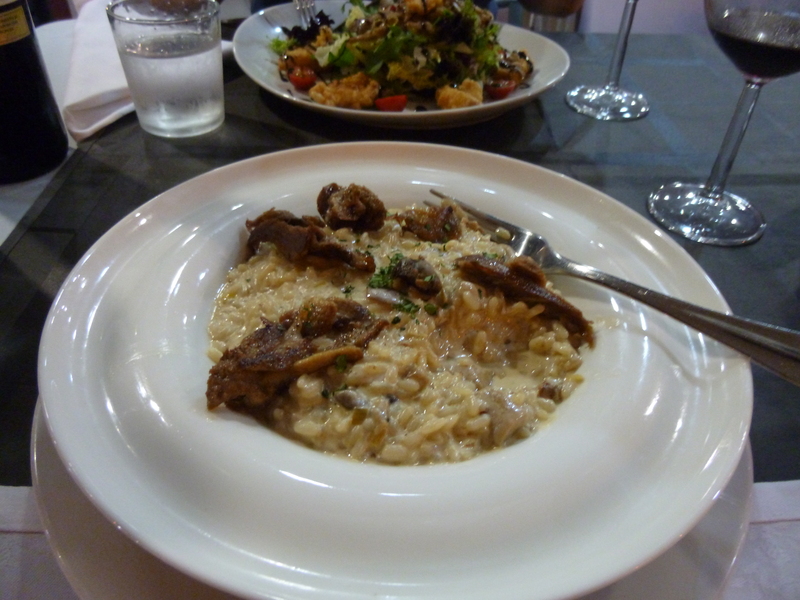 Risotto with mushrooms and duck. You can see part of Ria’s amazing salad in the background. This entry was posted in Albergues on the Camino, Camino de Santiago, Spain and tagged beginning, Camino de Santiago, Women Walking. Bookmark the permalink. Hang in there girlfriend! Love hearing from you! Our mission is to strengthen veterinarian-client-patient communication and support relationships between people and their companion animals. All those steps at the end of a long day of walking, nightmare! Buen Camino. You are amazing! The meal looked amazing too! Do you eat that good along the way? Probably will not know until you complete. The body needs good nourishment to keep up with the exercise and the spirit needs good looking food to look forward to when you stop especially the evening meal. At least that would be my context for walking the Camino del Norte. Stay in the NOW and enjoy! Peaceful steps. The internet says Pasai Donibane is a lovely fishing village. Hope you are getting some eye candy along with all those steps.! Missed seeing you before you left, but glad to read you are well on your way, traveling light this time. I wish you good weather and pleasant companions on the Camino. Great to see a post from you, I can’t wait to hear more about your journey… whether you post from the road or after you return home. The beginning is TOUGH but you’re doing it! Buen Camino!! ….I liked the reference to the approach to Mt. Sneffels. Will be doing the Norte next Spring so will be reading your accounts with interest !